Harper only wanted a safe, normal life. But when her younger sister Gemma runs off with a dangerous clique of beautiful girls, Penn, Thea, and Lexi, everything changes. Vowing to get her sister back no matter what the cost, Harper must face dangers unlike any she’s ever experienced. Fortunately, she has Daniel by her side, a gorgeous guy who’s devoted to helping her find her sister—and who’s immune to the girls’ dark powers. While Harper searches for her sister, Gemma struggles to adjust to her new life. Gemma’s powers are growing by the day, and the longer she lives with her new “sisters,” the harder it is to resist entering their magical world. It’s a realm both dark and beautiful, and where she’s plagued by strange hungers and unspeakable needs. Just as she’s drifting far away from her old life, Harper and Daniel find her…but no one can deny how much she’s changed. All she wants is to return to her family and the mortal world, but how can she do that when she’s become something else entirely—and will they still love her once they learn the truth? Mild spoilers for book one ahead!!! This book picks up right where book one left us. Gemma is gone with the shapeshifting monsters and Harper will do anything to bring her back. She and Alex word hard at trying to figure out what those girls are and how to get their Gemma back. With the help of the ever gorgeous Daniel, they must do everything in their power to find Gemma. While the three do their best to find her, Gemma struggles with her housemates and her new found abilities. She discovers things about herself and those around her that make her that much more cautious. Will they be reunited? I’m really not sure how I feel about this series. I guess I’m just getting super picky with my reads lately or something. This book just wasn’t anything exciting for me. Harper is a fine character, a good sister with a world on her shoulders complex. Alex is a charming boy next door trying to save his girlfriend. Gemma is a newly supernatural being. Daniel is my favorite. That’s pretty much how I sum up this book for you. I know this series is going to be four books, but I have no idea why. I really felt like nothing really happened in Lullaby. I mean, sure stuff happened, but it’s like New Moon and all those months when Bella just sits there. Maybe I just expected more, or maybe my reading slump is affecting me. I guess I just wanted more out of this book. I actually enjoyed book one, thinking this series will be fun, but now I don’t know. While I say all this, the next person who reads the book may think it’s the best thing since sliced cheese, so don’t take my opinion too seriously. Especially if you love Amanda’s writing. I do. I really do enjoy her stories and after all of this I’m still going to say I’m reading the next two books in the series. I’m just hoping the next book gives us more character development and story. Also, more Daniel. 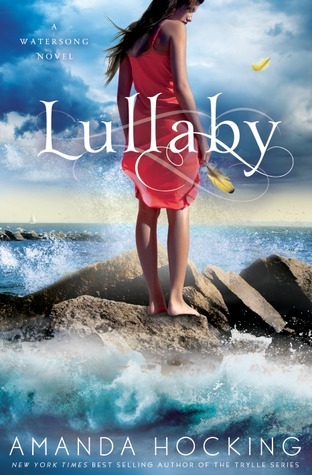 Lullaby hits shelves November 27th. Let me know what you think!